Well, you recovered enough to have the patience to do individual servings and stylish, two-layered ones at that! I dunno if I'd have recovered at all. I can swear u ve patience standing and reducing the milk after 11 pm! I never attempted anything after 8 pm in my kitchen! This one really brings lots of sunshine! looks too good :) ..the effort is worth it but not at 11 at night and plus you were tired :)...our mothers always made things look so easy for us , but when we try it out that in practical we know arey baap re! Jokes apart, very nice sweet dish and looks terrific!!. I think there is no escape from reducing the milk by boiling. I have used a 20 to 25 % solution of milk powder to simulate 50% reduction. It was Ok if the final product is heavily flavored with Vanila, cardamum et al. Otherwise the typical aroma and taste of a slow boiled kheer is un-replaceable. looks simply irresistible!! I think it's worth the 1 hour 20 minutes of effort!!! that's a delicious drink indeed; I love mangoes and I'm a real dairy sweets freak!! Just the sunshine for the cold gloomy days. Looks magnificent yes. I found these couple of weeks ago, they are called - yellow mangoes, name cannot get mundane than that but they are the best. No strings and when ripe sweet. I found them in an international market. If you have one you should pay a visit. Looks beautiful and so os drooley. I am sure you will maintain your great sense of humor all the time !! You talk about boiling milk at 10 in the night, I would have blown my top even at 10:00 AM on Saturday. Loved the aam ki kheer and also happened to see that easy breezy mango dessert. Will definitely keep them in mind. Sandeepa, I was just telling a couple who's about to get married about howm my wife and i used to eat out every night before we got married. Streetside. And yet I went bankrupt a couple of days before I got married. Just came back to the post again and was marvelling the photos. Jibe jol pore. Hi.I just found your blog & love all the recipes... my husband is from Bangladesh, so now I have some great recipes to try thanks to your blog. ooh, that is mean to talk about mangoes in winter. happy winter and new year to you, D and the little angels. just looking at it makes me happy..
Too sad that the mango season in India gets over really fast. I haven't seen canned mango pulp in the city I stay in. Maybe I will deep freeze some in the next season. Till then, I shall have to wait till the summers to try this recipe! 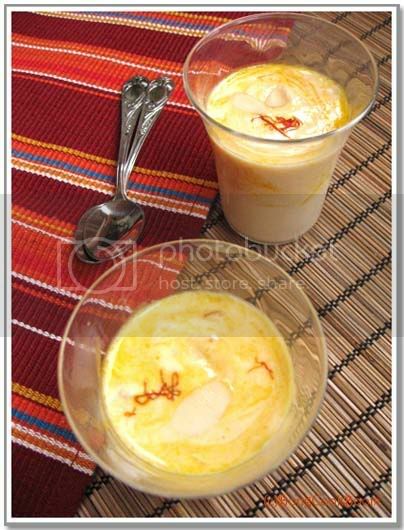 MMMmmmmm Sandeepa a sunshine recipe with sunshine pictures. I can imagine the ordeal of reducing the milk.. never did it. oto raate baniye abar eto shundor photo tulle at bolcho patience nei..
MAngo in the midst of winter, that's really a wonder. 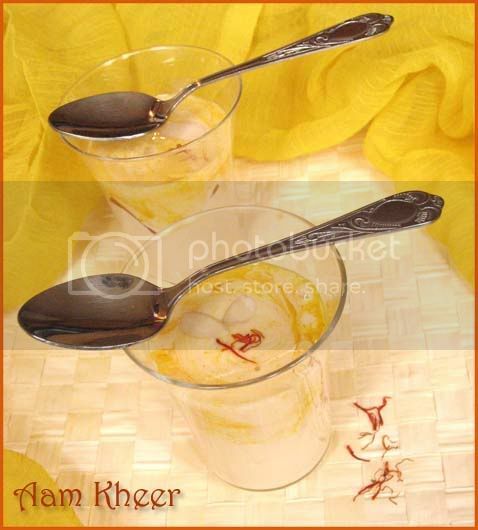 the aam kheer looks so gorgeous. Reading this recipe thought about sharing my version, which is slightly different bust tastes yummy. Heat the mango pulp and boil for 3-4 mins. Take off from fire to cool a bit and add the double cream. Put it back on fire and cook for 5 mins. This ets done in literally 15 mins start to finish. I serve them in a small shallow soup bowl with a nice dollop of Vanilla ice cream in the middle.